Present state: North of the former level crossing the platforms and buildings have been demolished. Bungalows occupy the site. South of the crossing the station house is in residential use. A replica signalbox stands opposite the station house on the site of the original signalbox and an original LMS lamp standards can be seen nearby. Notes: Helmshore station was located on the East Lancashire Railway’s (ELR) Clifton Junction to Accrington line which had opened in stages between September 1846 and August 1848. The section of line through Helmshore was originally promoted by the Blackburn, Bury, Accrington & Colne Extension Railway (BBACER), which was incorporated on 30th June1845 to build a T-shaped line between Stubbins and Colne/Burnley via Accrington. Three weeks later, on 21st July 1845, BBACER was absorbed into the East Lancashire Railway (ELR). settlements, was expanding as the cotton industry grew and prospered, promising rich financial rewards for the railway. Helmshore station opened along with the entire 7.4 mile section of line between Stubbins Junction and Accrington on 17th August 1848, the line from Stubbins to Clifton Junction having opened nearly two years previously on 25th September 1846. The line required heavy engineering works and had severe gradients as it ascended from about 450ft to the summit of 771ft at Rising Bridge in only 2½ miles. From Accrington there was a lengthy climb at 1 in 40, easing to 1 in 47, and then 1 in 100 through Baxenden to Rising Bridge. From Haslingden the gradient was 1 in 76 downhill, slackening to 1 in 97 through Helmshore station, continuing down at 1 in 78 to Stubbins Junction. The goods yard was sited behind the southbound (up) platform and comprised four sidings, one of which passed through the goods shed that backed onto the platform. A 10-ton crane was installed. One of the sidings was private serving the adjacent Albion Mill with direct access into the mill from a small turntable. There were further sidings on the down side of the line, one serving J. Porritt & Sons. 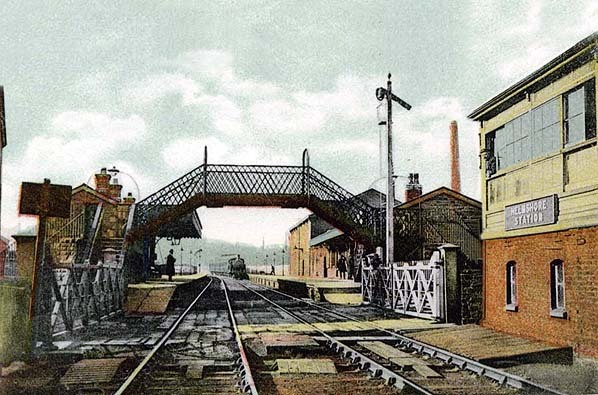 On 4th September 1860 the continuous gradient through Helmshore station contributed to a serious accident. Three excursion trains were returning from Salford. The first passed through Helmshore on its way north, without incident. The second, with about 1,000 passengers and 31 carriages, entered the station, where it stopped for passengers to alight. When the guard released the brakes there was a jerk, and 16 carriages broke away from the train and started sliding southwards down the line towards Stubbins Junction. Mr Shaw, the superintendent, saw what had happened and unhooked the engine from the train in order to go down the other line to warn the third train, but unfortunately he was too late. The carriages had already run 400 yards down the line and collided with the oncoming train. Eleven people were killed and one hundred were injured. storey structure notable for its round-headed windows in the style of the passenger building, stood apart from the platforms, south-east of the level crossing, and south-west of the tracks. On 13th May 1859 the Lancashire & Yorkshire Railway (LYR) absorbed the ELR. The LYR started to use the route through Helmshore as an alternative to its congested main line between Manchester and Leeds, which brought much extra traffic. The LYR also routed much of its holiday traffic through Helmshore. provided a link to the Accrington direction platform. On the Accrington-bound platform an attractive building was added to provide additional waiting facilities. It was opposite the main building, and similar in size, with sets of double, paired, round-headed windows alternating with door openings of similar design: these features complemented the details of the main building. The slate roof was ridged, and a small awning with crenulated ends provided shelter for part of the building’s length. South-east of the crossing was a brick, hipped-roof signal box which faced the station house across the tracks. By 1882 Helmshore was being served by fourteen trains in each direction. On 1st January 1922 Helmshore became part of the London & North Western Railway (LNWR) but a year later that company was in turn absorbed into the London Midland & Scottish Railway (LMS). By summer 1932 the station had seventeen northbound services on weekdays; most went to Colne but three went only as far as Accrington. The first northbound service was for Colne, and it left Helmshore at 6:01 am. The last service which had originated from Manchester Victoria left Helmshore for Colne at 11:07 pm. Eighteen trains travelled south to Manchester Victoria on weekdays. The first southbound departure was at 6:15 am and the last was at 10:11 pm. respectively.) As with the other stations between Accrington and Bury - apart from Baxenden - Helmshore station was fitted with BR (LMR) enamel totem signs until closure. The June 1965 to April 1966 timetable showed that there had been little change in Helmshore’s passenger service frequency since the 1950s, with fifteen northbound Monday-to-Friday trains (thirteen on Saturdays), and fifteen southbound on weekdays, but there were no Sunday trains. At the northern end of their journey trains travelled to or from Accrington, but some extended to or from Colne, Skipton and Todmorden. 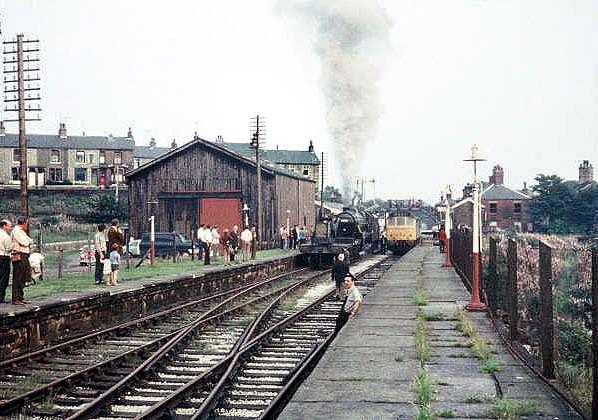 opened a railway museum at Helmshore station on 16th August 1969. At this time the track was still in situ, and, with a view to reopening the line, an offshoot of the HDRPS called the East Lancashire Light Railway Company (ELLRC) was established. Unfortunately the British Railways Board removed the rails through Helmshore in October 1971, and the group transferred its attention to Bury. The ELLRC went on to become the East Lancashire Railway, and they opened part of the original ELR line between Bury and Ramsbottom in 1987. 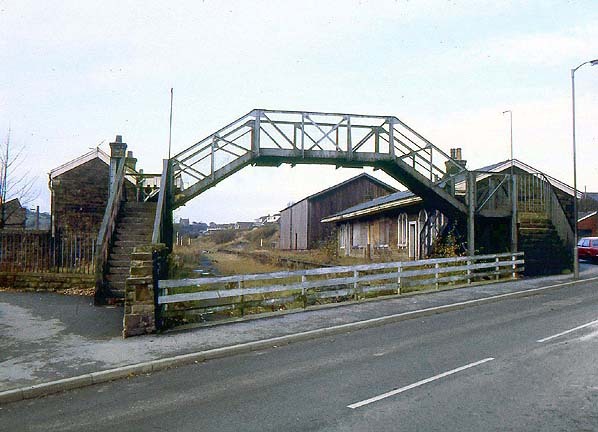 In 1991 they opened a further section of line to Rawtenstall. Helmshore station, stripped of rails and no longer the subject of preservation schemes, became derelict. The April 1976 photographs show that the platforms and buildings were substantially intact, though vandals had begun to turn their attention to the station. Eventually all structures north-west of the crossing were demolished, and bungalows now occupy the site. However on the opposite side of the former level crossing the station house is in residential use, and on the site of the brick signal box is a stone structure sympathetic in style to the original, and complementing the station house. Between the ‘signal box’ and the road, an LMS concrete lamp standard provides a bracket for a hanging basket, and a small plaque gives the dates of opening and closure of the ‘Helmshore Railway’. 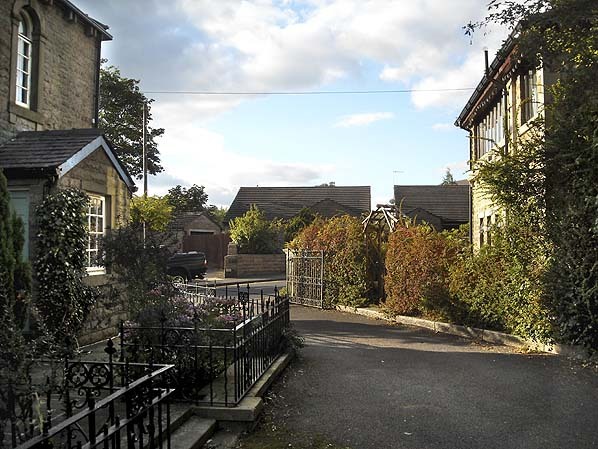 Housing development in the last fifty years has joined the built-up area of Helmshore to the town of Haslingden. Something of its former village atmosphere survives, however, and many visitors with an interest in industrial archaeology are attracted to the former Higher Mill and Whitaker’s Mill, refurbished as the Helmshore Mills Textile Museum, only several minutes’ walk from the former station. See also the Ramsbottom Model Railway Club web site which features 106 old photographs of the East Lancashire Railway and photographs of the clubs excellent layout of Ramsbottom & Stubbins. Looking northwest towards Helmshore station c.1905. In the foreground is a level crossing which was controlled by the signalbox on the right of the picture. Beyond the crossing is the station which by this date had been developed to what would be its optimum. In the distance a train bound for Manchester can be seen approaching the station. 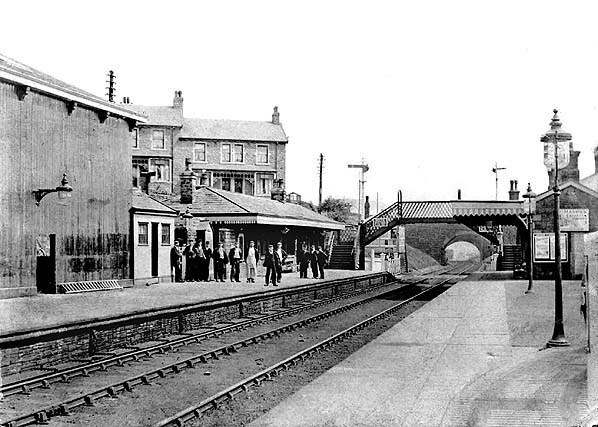 Helmshore station looking southeast from the north end of the northbound (down) platform in the early years of the 20th Century. A group of railway workers poses for the camera on the southbound platform. To the left of the picture the station's wooden goods shed can be seen. 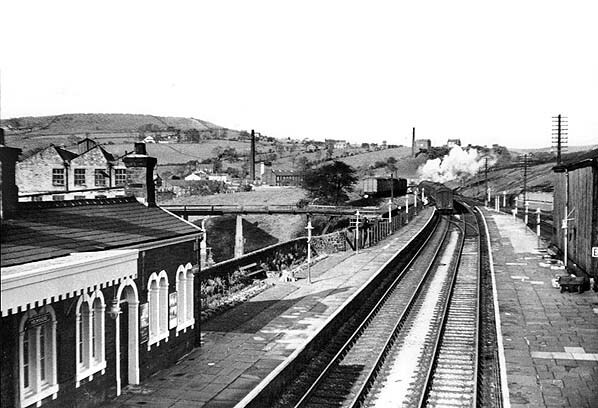 Looking northwest from the footbridge at Helmshore station in October 1959. A train, probably bound for Colne can be seen departing from the down platform. 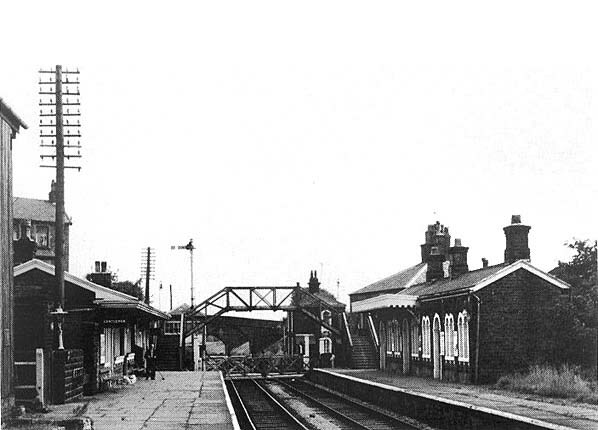 Looking southeast from the up platform in 1966 just before closure. The station retained its facilities right up until the end. In 1970 Helmshore station was the base for what eventually became the East Lancashire Railway preservation society. In this view looking southeast, a preserved steam locomotive and a British Rail diesel were active at the station which was being run as a museum. 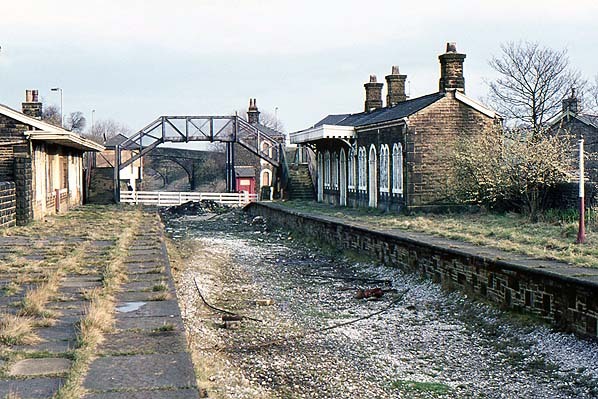 Looking northwest towards Helmshore station in 1974, three years after the track had been lifted. Looking northwest along the trackbed towards the site of Helmshore station in September 2010. The station was on the far side of the road that can be seen middle left. The building to the left was the station house. The building to the right occupies the site of the signalbox.